After receiving a Bachelor’s degree in Philosophy and Religion from James Madison University in 2008, Angela knew her education was not over. She went on to attend Alvernia University and received three teaching certificates in 2011, followed by teaching at both the high school and middle school levels in Pennsylvania. During her time as a school teacher, Angela found great stress relief through yoga. She studied in both San Diego and Thailand to become 500-hour registered yoga teacher. She has also completed Anatomy Trains levels I and II. Angela Bereski’s desire to help facilitate the healing process through yoga soon became her driving force, and she moved to Colorado to begin her new journey of starting a yoga business. Wanting to pursue more in the healing field, Angela knew that massage would make a good partner for yoga. Boulder Massage Therapy Institute provided Angela Bereski with her massage therapy education. 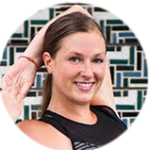 Massage, yoga, and education remain Angela’s great passions as she continues to teach and learn. When she is not teaching, Angela loves to read, hike, and spend time with her bearded dog, Tula.